1. In a big enough pot, cover the ham with water. Bring to the boil and drain off all the water. Cover with water again and add the remaining ingredients. Bring to a simmer and turn down low. You just want small bubbles popping to the surface. If any scum floats up, remove with a spoon. Top up with more water if required. Do so for 2 hours. 2. 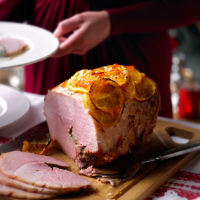 Remove the ham and place on a plate to cool, reserving the water for ham soup, stock, sauce etc. 3. Preheat the oven to 190˚C. 4. When cool enough to handle, remove the string or mesh the ham is in, carefully slice off the skin to leave the beautifully wobbly fat. Using a knife, criss cross the fat into a diamond pattern. 5. To make the glaze, gently warm the marmalade, crushed peppercorns and whisky. Using a pastry brush, brush all over the ham with half the mixture. Next, place the thin sliced orange like fish scales all over the ham. Then brush with more glaze. 6. Place on a baking tray and roast for 30 minutes until the ham is sticky and coloured. As it cooks, the glaze will run off and water will come out of the ham - with a spoon, baste this over the ham as it roasts. Remove from the oven and allow to cool for 15 minutes. 7. Place on to a serving dish, warm the remaining whisky gently in a pan and pour over the ham. Dim the lights and ignite the gammon to flaming Christmassy glory. Behold the ham! This recipe was first published in Tue Dec 10 16:50:00 GMT 2013.